Jon Hicks came to SXSW in 2005 and made quite an impression on many of us. It’s no surprise, he’s an incredibly nice chap. 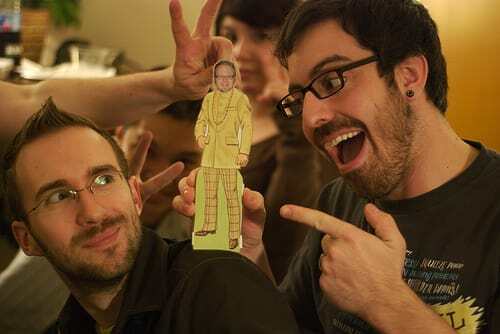 Well, when Jon could not make it to the festival in 2006, Glenda Sims filled the void with a paper doll named Flathicks. The idea was that, through Flathicks, Jon would be able to be photographed at parties, talks, and the like, so it’d be like he was there. Shaun Inman, Flathicks and Jason Santa Maria. Flathicks quickly took on a life of his own and his adventures went far beyond SXSW. We handed him off, from person to person, as we traveled around the world, back to our homes, to other conferences, etc. In fact, he joined Kelly & me in Sydney, Australia in late 2007 at Web Directions South and then flew back with us to San Francisco to attend An Event Apart. You can follow his adventures on Flickr or even check out his personal Flickr account. Kelly has had a bit of bad luck when it comes to SXSW. The first year she went, 2006, she got food poisoning just as we boarded the plane to go to the festival. She ended up spending the majority of her time in our hotel room, recovering, and missed most of the festivities. She did manage to muster enough strength to attend the conference for a bit to see Jeremy Keith & me deliver “How to Bluff Your Way in DOM Scripting”, attend the first Web Standards Project meeting, and then attend a party or two, so the trip was not a complete bust for her. But it wasn’t nearly as enjoyable as it should have been. Kelly planned to return with me in 2007, but caught the flu about a week before and had to cancel. SXSW is a well-renown incubator of illness (“Southby Scurvy” as we affectionately call it) and Kelly did not want to be patient zero that year, so she bowed out. Coincidentally, Jeremy’s wife Jessica was unable to make it in 2007 either. So Glenda, being the incredibly sweet woman that she is, made us paper dolls of Kelly and Jessica. She dubbed them “Kellydoll” and “Jessidoll” as she didn’t feel “flat” was appropriate as part of a woman’s nickname. 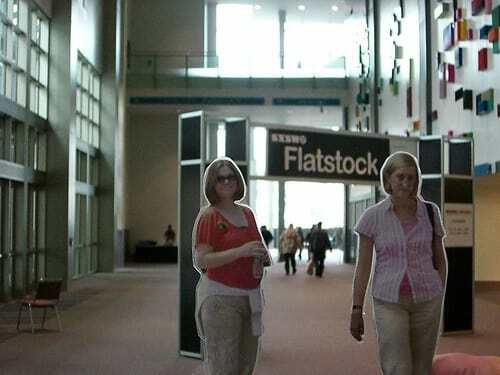 Kellydoll and Jessidoll attending the appropriately-named “Flatstock” (a poster festival). As with Flathicks, Kellydoll & Jessidoll had amazing adventures at the festival and had their photo taken with everyone who missed them. I carried Kellydoll with me everywhere, her head poking out of my backpack. This turned out to be a bad idea however as it facilitated her escape. I must have been boring her. 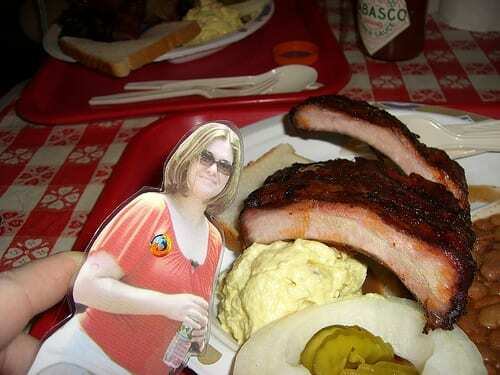 Kellydoll enjoying a rib plate at Ironworks. I realized Kellydoll was missing on the last night of SXSW, on the way back from dinner at Ironworks, where she had been the subject of a few photos. It was raining, so I had been rushing back to my hotel room when I saw another potential opportunity to photograph her. When I reached back to get her, I realized she was gone. I spent the next hour and a half combing Ironworks, Red River Road, First Street and a few of the other lanes around the Convention Center, retracing my steps, looking for any sign of Kellydoll. I came up empty-handed & sulked back to the hotel, depressed that I’d lost my little paper wife. I never did find Kellydoll, so she and the real Kelly never got to meet. Maybe she’s still out there having adventures. Or maybe she ran off with Flathicks when my back was turned. It’s hard to believe that SXSW Interactive is 20 years old. Reading through the remarks and stories in this awesome piece from Fast Company, I felt inspired to share some of my SXSW stories. This is the third.